Rare and in exceptionally good running order. Lovingly restored Gardner 4LW – 56 HP (800 rpm ), four cylinder fully marine specification engine. Cast iron crankcase, aluminum rocker cover, extensive copper and bronze fittings. Freshwater cooled and in excellent running order. Rebuilt 1970’s by a Gardner engineer with low hours operation since. Complete with 2:1 marine gearbox. See History at the bottom of photographs. This Gardner 4LW was removed from a Fleetwood inshore fishing boat, a Fife named Kathleen, owned by Steve Welsh. 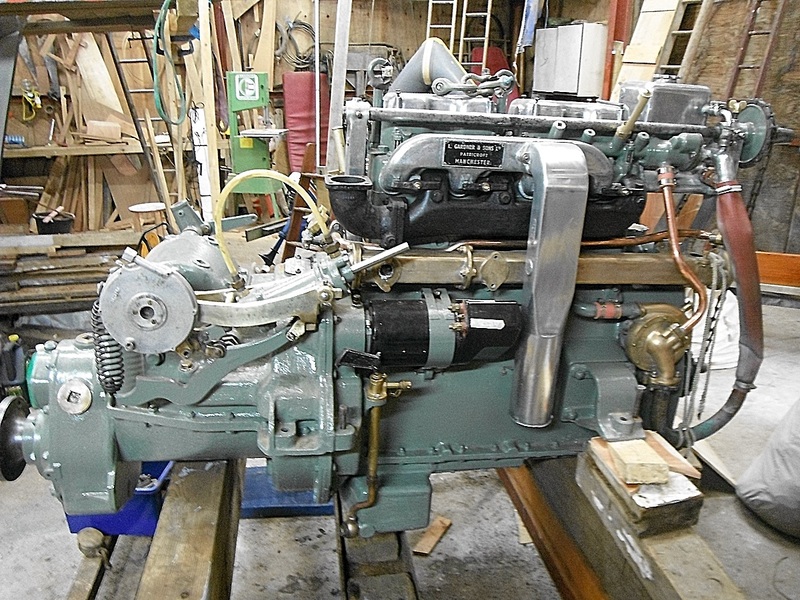 Lionel Halliwell was on the lookout for a replacement engine for his MFV yacht Tranavanog. Although the engine had seen good service it had potential as it was the right size, and living next door to Lionel’s parents at Knott End was Andy Baillie who was said to be a Director at Gardner’s. 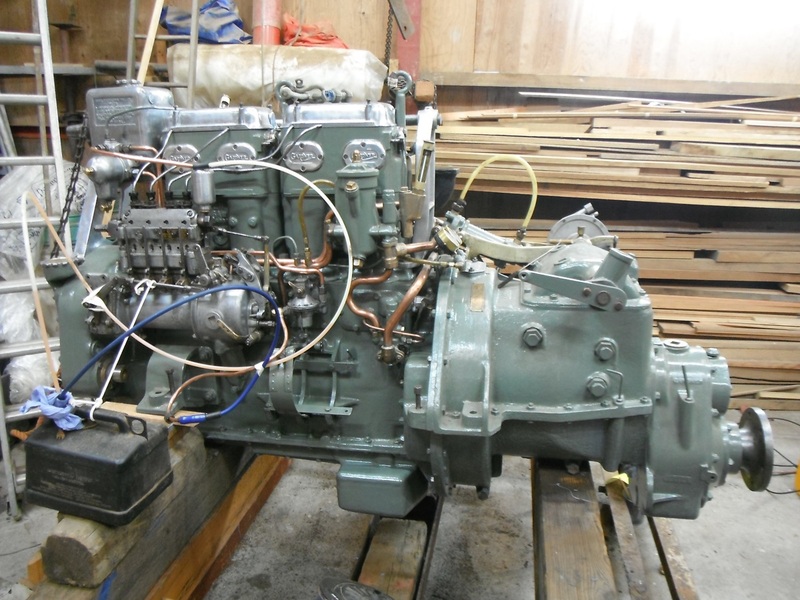 A decision was made to buy the engine around 1970 at a guess. Lionel was to clean all the parts, Andy and the Works (Gardner’s) would assess what was useable and what parts needed to be replaced. Roger Unsworth crewed for Lionel aboard Tranavanog from 1974 and was told several anecdotes about the rebuild which are the basis for this historical information. 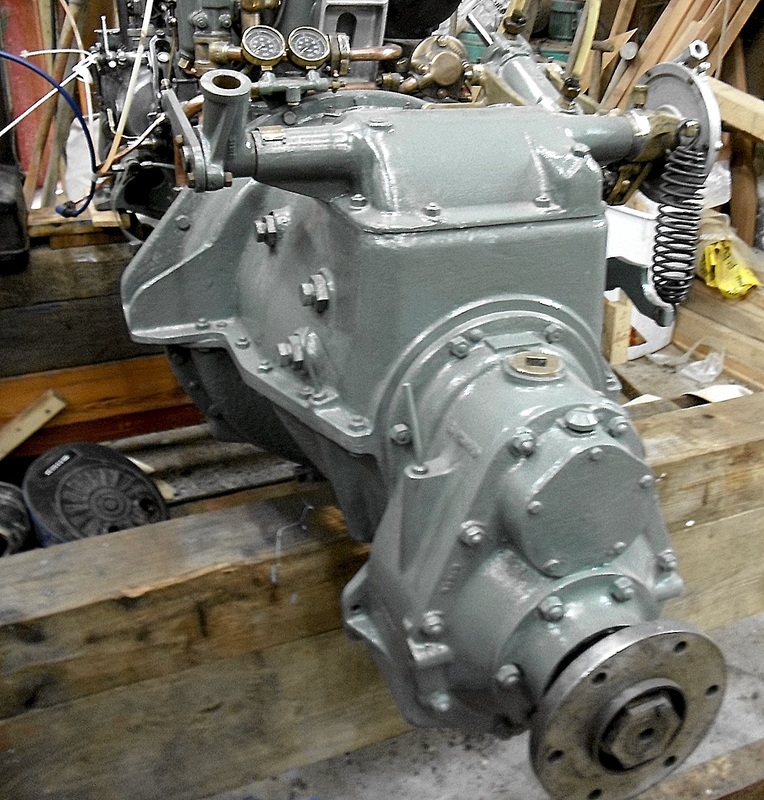 The engine was effectively rebuilt from scratch, virtually to new specification although the crankshaft was trued to undersize. All the work was supervised by Andy and parts purchased at Works prices which was just as well because a lot of new parts were fitted most of which are listed below. Lionel used to tell me that the engine dated from the 1930’s but the engine number on the corner of the iron crankcase is illegible. The number on the fuel pump refers to late 1946 but there is no way of knowing if this is the original pump. I imagine that the pump and governor were completely overhauled at the Works as Lionel would have had no facilities for such work. After installation, the boat was used as a weekend yacht for trips into Morecambe Bay and remained in Lionel’s possession until he became unwell around the year 2000 when the boat was sold. The new owner also used the boat lightly and became unwell so that the boat became so neglected as to be beyond economic repair and the engine was removed. Although it’s a long time since the rebuild the engine has not accumulated many running hours for an engine of this type. Please email from this site or call (office hrs) 01253 893830.